Talkcarwash: Vendor exhibits - Clean World Distribution, Inc. Experience the Difference with the Rhino Mat Systems! For the past 15 years we have been dedicated to the innovative design and technology of developing superior mat cleaning systems. 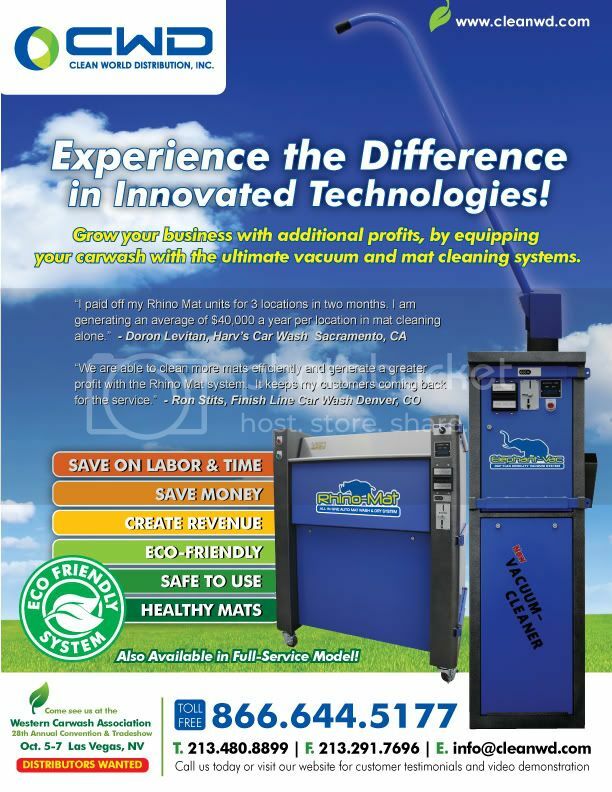 Our dedication to manufacturing superior mat cleaners has brought us worldwide recognition. Our mat cleaners are currently operating in the US, Canada, Asia and Europe. The quality and effectiveness of our mat cleaners have been improved over the years to meet the demands of our customers in order to better meet their needs. We value our working relationships with our new and returning customers, which is why we are devoted to bringing quality equipment to those who need it.